This paper investigates the macroeconomic risks associated with undesirably low inflation using a medium-sized New Keynesian model. We consider different causes of persistently low inflation, including a downward shift in long-run inflation expectations, a fall in nominal wage growth, and a favorable supply-side shock. We show that the macroeconomic effects of persistently low inflation depend crucially on its underlying cause, as well as on the extent to which monetary policy is constrained by the zero lower bound. Finally, we discuss policy options to mitigate these effects. Specifically, we begin by considering a fall in long-run inflation expectations below the central bank’s inflation target. Such a development would have minimal effects on output if the central bank was free to adjust policy rates, or at least could do so in the fairly near term. By contrast, a fall in long-run inflation expectations reduces output substantially if the economy is mired in a persistent liquidity trap. This reflects that the fall in long-run inflation expectations boosts real interest rates far out the yield curve, including through extending the duration of the liquidity trap. On top of the impact of higher real interest rates, they also recognise the damaging impact of lower inflation expectations in turn lowering nominal wage growth and causing further hits to output. Perhaps it is just stating the obvious, but at least they recognise the problem. While suggestive, this analysis understates the economic costs of a fall in inflation expectations … lower long-term inflation expectations not only depress the mean level of output in a liquidity trap but also intensify downside risks … we show that a deceleration in nominal wage growth due to higher wage flexibility can have sharply contractionary effects on output in a liquidity trap by causing price inflation to fall and real interest rates to rise. The authors are too bit mealy-mouthed about coming out in favor of price level targeting, because it is somehow against the tradition of being inflation hawks. We conclude with a brief discussion of how monetary policy can help to alleviate low inflation pressures. An important and influential literature has recommended commitment based strategies such as price level targeting, including e.g., Eggertsson and Woodford (2003). While potentially efficacious, such an approach would involve a substantial departure from the typical focus of central banks on inflation. Confusingly, their solution is actually to depart even more from a focus on inflation, with a couple of real economy measures. 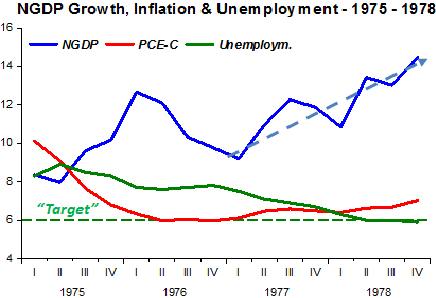 The history of targeting real economy measures is not good, real GDP, the unemployment rate, the output gap. All hit problems, partly because they are dependent on factors that are outside the control of the central bank, like productivity, innovation and structural changes – or just incredibly hard to estimate. 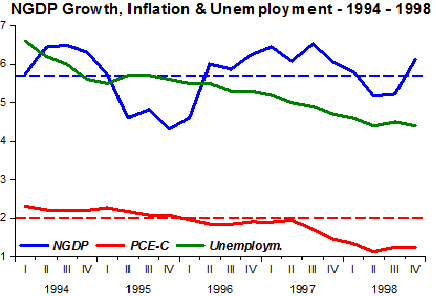 We suggest an alternative in which monetary policy responds to a broad measure of resource slack that includes a state variable – the capital gap in our model, or the labor force participation gap in a model with richer labor market features – that recovers particularly slowly following an economic downturn (see e.g. Erceg and Levin (2014)). Because such a rule causes inflation and output to overshoot as the economy recovers, it boosts longer-term inflation expectations while the economy is still mired in recession, which mitigates the severity of the fall in both inflation and output. If the goal of these proposed real economy targets is to boost longer term inflation expectations, why not just eliminate the middleman and target higher inflation expectations themselves? 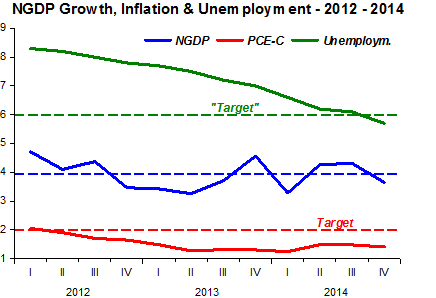 Or better still, target nominal growth expectations. Real targets should be nominal targets, just realistically high ones and not capped by 2% inflation projections. The tight-money crowd is dominant in central-bank staffs, and so firmly (and self-perpetuatingly?) ensconced in such independent government sinecures that they look likely to outlast all rivals. That tight-money enthusiasts preach an increasingly dubious religion or ideology—I have dubbed it Theomonetarism—is unimportant. They have allies in media and academia, curiously always on the right-wing side of things (with some exceptions, such as Ramesh Ponnuru at National Review, James Pethokoukis at AEI, and Scott Sumner, of the Mercatus Center at George Mason University). The latest tight-money sermon comes from Daniel Thornton, an excellent writer and former veep at the St. Louis branch of the U.S. Federal Reserve, who damns the Fed for quantitative easing (QE) and low interest rates, in Requiem For QE, written for Cato Institute. Thornton also reiterates that the Fed was kicking Grandma; poor and elderly savers get hurt by low yields. And, of course, Thornton sermonizes that QE and low interest rates threaten injurious inflation down the road. Like wrestling with a criminal octopus in Sodom and Gomorrah, it is difficult to know where to begin with Thornton. Wrong is everywhere. But let’s just hack away. Thornton also complains that QE-zero bound causes a “marked change in the behavior of commodity prices.” Well, one has to smile at this one. There were no commodity boom-busts before QE? BTW, gold hit $887.50 an ounce in 1980, before hitting $273.00 in 2000. Oil has been everywhere and done everything since the 1970s. I think what Thornton wants more than anything is to say, “higher commodity prices signal too-easy money.” That has been the standard refrain from the Theomonetarists since the 1970s, when the U.S. had double-digit inflation and OPEC was jacking up oil prices. In ensuing decades, we had the Chinese industrialization and full-throttle demand for all industrial commodities, while the U.S. ethanol program boosted corn prices, a basic agriculture good (they feed corn to pigs and cows, btw). Global oil was controlled by uncertain thug states. The last three decades have been a great run for commodities, and for inflation-hysterics who could endlessly siren about commodities prices. But since QE started in 2009, commodity prices have been zooming—downhill. Copper has been cut in half, and gold is way off. Oil is cut in half too, and still going down. Thornton is reduced to saying QE results in a “marked change” in commodities prices. Yes, a “marked” reduction, so far. Frankly, there are global markets for commodities, and global supply. The Fed went to QE and a nominally low federal funds rate, and commodities prices subsequently tanked. What is the connection? Thornton credits a “resurgence in house prices and residential construction beyond what is warranted by economic fundamentals” to QE and low interest rates. Here Thornton seems unaware the basic facts. 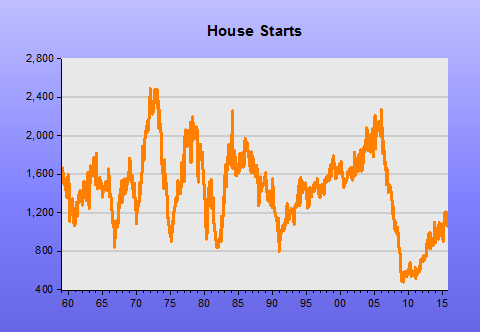 Housing starts are in the toilet. Actually, based on demographics, the U.S. has been under-building housing for years. As for house prices, noose-tight city zoning regulations prevent much new housing stock, and that plays a key role in national housing costs. Does Thornton mean to say U.S. apartments rents are rising (as they are), as there is too much residential construction? How does that work? The unfortunate truth is that even a merely mediocre economy in much of the U.S. will result in higher housing costs. It is a gigantic structural impediment. The solution to rising housing costs is much more liberal city zoning, or even no zoning. Thornton’s solution, on contrast, is to suffocate the economy enough that we obtain house price stability, despite regional housing shortages. Good luck with that—it is called 2008. Then we have Thornton’s assertion the Fed has caused “excessive risk-taking.” This reprises the “Fed as Mommy” role. You see, in free markets investors and business managers go bananas when interest rates are low. The free-market system is an inherently unstable platform on straw-like stilts, one that collapses whenever investors and business managers are not kept in check by an ever-vigilant Fed. Anyway, American corporations are actually sitting on huge piles of cash and not taking risks. There is not enough demand to warrant expansionist behavior by those who produce goods and services. “Income was redistributed away from people on fixed incomes and toward better-off investors, “ avers Thornton, a reprise of the “Fed is bashing Grandma” argument. One wonders how to respond at less than encyclopedic length to this assertion. Interest rates have been falling globally for decades, and are negative now in many nations, including the famously tight Switzerland. Low rates are a sign that money has been tight, as Milton Friedman said. Monetary policy must be made for the general good, not any particular group or region. Raising rates hurts investors of all stripes—including those who risk equity to start businesses or invest in real estate. In fact, the Fed must be callous about poor people invested only in short-term risk-free assets. Helping the poor is the job of government and charity, not central bankers. Thornton adds, the “huge increase in the monetary base that QE entailed could cause inflation if the Fed loses control of excess bank reserves.” Again, one must suppress a smile here. Since 1980, has the tight-money crowd ever written a monetary paper that did not warn of the perils of pending inflation, due to Fed laxity? We have lived through five of the last zero hyperinflations, about 23 runaway inflations, and 71 double-digit inflations. Oddly, after decades of wanton laxity by our central bank, we are now paying the price—core PCE inflation is drifting down towards 1%, or perhaps lower if the Fed induces another recession. In many regards, I have not been fair to Thornton in this brief blog. Thornton does ponder why the Fed is paying interest on excess reserves, thus suffocating some of QE’s stimulus effect. Thornton also criticizes the Fed for not expanding its balance sheet pre-2008, in the early days of failures by financial institutions. As I have said before, the tight-money crowd has been increasingly erratic since 2009, and the failure for inflation to erupt following QE, or for there to be any detectable consequences for the Fed’s balance sheet (other than taxpayer relief, and some stimulus), let alone catastrophic results. The Theomonetarists are reduced to flying their tattered, sun-bleached storm flags for inflation (as does Thornton), and attributing all present-day economic ills to QE or low interest rates. In fact, the Fed is too tight. We see weak demand, but global supply lines are thick and unused. We see that PCE core inflation is sinking below even the Fed’s niggardly 2% target. We see unit labor costs nearly dead-flat for years on end, a rising dollar, up 20% in last 18 months. The Fed should target a robust growth rate via nominal GDP level targeting, and heavily use all tools at its disposal to get there, including QE and even negative interest rates. Jeffrey Rogers Hummel has written a very useful post about base money in the US and the difficulties in accurately tracking the number. It has led us to an attempt to explain the interaction between base money, excess reserves, interest on those reserves and the 2008 crisis. Confining the definition of the monetary base and total reserves to only non-interest bearing, Fed-created outside money would yield the results for the period from 2001 to mid-2015 depicted in Figure 3, 4, and 5. With this adjustment, the mere $500 billion increase in what we can call the “outside base” since September 2008 represents merely a slightly more rapid rate of increase than the rate of increase in the base the decade prior, and nearly all of that recent increase has been in the form of hand-held currency. Market Monetarists are clear about why high inflation has not materialized. QE has been handicapped by other elements of monetary policy. Essentially, the Fed has not wanted higher nominal growth, and it has got its wish. 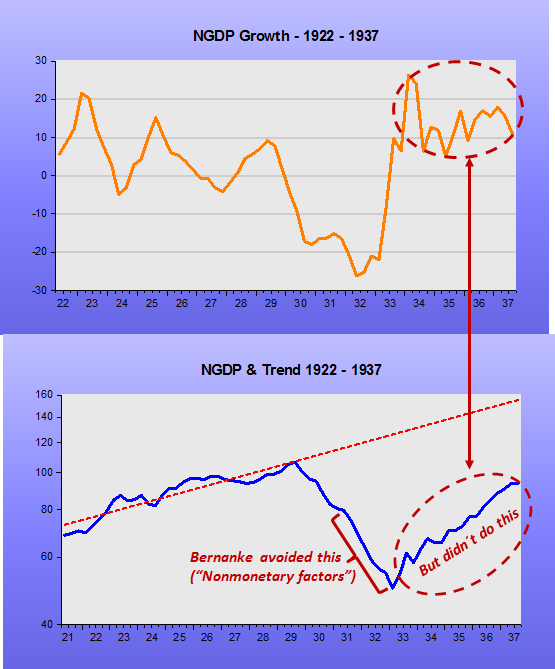 The Fed could be said to be anti-nominal growth and, therefore, effectively anti-growth. 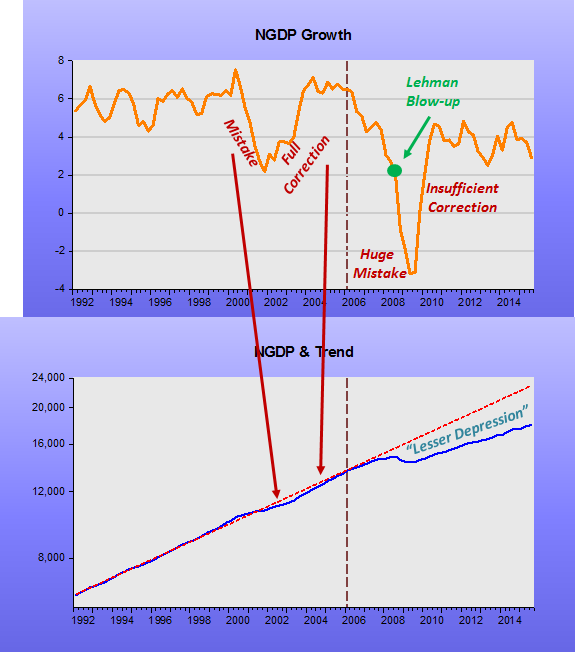 In a series of posts earlier this year at Historinhas, summarised here Mark Sadowski indicates that expansion of the broad monetary base by QE Granger-caused what nominal and real economic growth the US has enjoyed. The base expansion has been nothing like enough to lead to any inflation, of course. That it is no surprise to us is due to the offsetting effect of Inflation Targeting and other restrictive monetary policies on nominal growth. The recovery the US has been, as a consequence, like pushing water uphill. The monetary base causes much confusion. As Hummel says, until 2008, US Base Money was essentially just “hand-held” currency, or cash in circulation, at least since WW2. There were large excess reserves built up during the Great Depression. Hummel is wrong to classify interest-earning excess reserves (i.e. assets of the commercial banks held at the central bank) as “inside money”, at least according to Gurley and Shaw the originators of the distinction with “outside money” . The mere act of paying interest on reserves fails to change it from “outside money” to “inside money”, if one sticks to these original meanings. “Inside money” is precisely defined. It is essentially private liabilities matched by private assets. For example, deposits at commercial banks are liabilities of the banks, but also assets of the private depositors. Commercial bank deposits or reserves at the central bank are assets of the commercial banks and liabilities of the central bank, but the central bank is special. It is a public institution and as the central bank it alone can create base money (medium of account) at will, out of thin air. So, the Fed’s balance sheet grows via its own new base money creation. Very broadly speaking, commercial banks balance sheets can only grow in aggregate if the Fed allows base money to grow. It has become harder to track this phenomenon in recent years with the rise of financial disintermediation. The whole “inside/outside money” concept is not commonly used by monetary economists who tend to avoid using the terms. They are more familiar to specialists in finance. Much of the confusion arises because money for monetary economists is “outside money” or base money, and is narrower than money in the mind of the general public. Hummel’s “outside base” money concept could be even narrower, but is not in common usage. Changes in base money are what predict changes in the nominal economy, which Market Monetarists see as sometimes having heavy impacts on the real economy in the short-term and medium-term. Changes in these broader definitions of money have much less predictive power. It is best not to think of “inside money”, or non-base money, as money at all when it comes to thinking about monetary policy. The velocity of the commercial bank reserves with the central bank can be just as volatile as velocity of currency in circulation. Both types of money can be hoarded during negative shocks, and rendered inert, other things being equal. A negative shock drives up the value of money and drives down the prices of non-money (deflation). Or vice versa, a positive shock, i.e. “hot economy”, drives down the value of money and drives up the prices of non-money (inflation). There were hardly any excess reserves in the post-WW2 era. Why would there be? The interest rate on excess reserves was zero and market rates were in the hundreds of basis points. There were also no serious, system-wide, bank runs. The financial crisis changed everything. Commercial bank (excess) reserves at the central bank exploded when Lehman went bust. These reserves were created as the inevitable counterpart of the emergency Treasury/Federal Reserve funding of banks and other financial institutions who’d found that in the pre-Lehman, but especially post-Lehman, liquidity crisis market-sourced funds were hard to come by. The decision to pay interest on those reserves highlights a somewhat hidden episode of the financial crisis, but one that Scott Sumner , David Beckworth and others have repeatedly called into question. IOER was a new concept for the US but is actually a very familiar part of the monetary policy landscape in the majority of monetary regimes. It is a second tool with which central banks can control the monetary base, by altering demand from banks for money, in addition to traditional open market operations buying financials assets (with new money, like QE) or selling financial assets (for existing money and thus reducing the amount of base money). In most regimes IOER is a little below market rates and has no significant impact on monetary policy or the amount of base money as it is more attractive to buy other short-term risk-free assets like T-bills. Most countries also have required reserves, usually as a percentage of some definition of deposits. In the US they are currently $91bn, versus $2,500bn of excess reserves or 25x as much. However, it is not the existence of IOER that is the problem, but the level of the remuneration in an environment of zero or near zero interest rates. The Federal Reserve decided to pay a rate of IOER above overnight and T-Bill rates because the market was driving those rates below where the Fed thought was desirable. Our chart shows how the market, as represented by the 4-Week T-Bill was constantly below overnight rates in the run up to the crisis, well below both the US (Effective Fed Funds rate) and London (LIBOR) money market rates. The “money market” is something of a misnomer as the “market” element is heavily influenced, if not actually controlled, by what target interest rate the central bank desires. The liquidity squeezes caused by financial turmoil in August/September 2007, March 2008 and then the third and final time in September 2008 are clearly visible by high levels of volatility. The fact that the 4-Week rate often fell further than rate cuts on rate cuts days shows how the market constantly worried that the Fed was behind the curve. The collapse in the 4-Week rate on the morning after the Lehman failure should have been the signal for the Fed to cut rates, as that was what the market both expected and wanted. But the Fed delayed, causing turmoil in money markets, that even spread to the rate closest to its control, the Effective Fed Funds. The turmoil in money markets seen in the chart happened because the Fed was not doing enough to cope with surging demand for money, by supplying more. And what money there was available had to be hoarded in some other risk-free place, causing the collapsing T-Bill rates as their prices were bid up, especially in times of stress. Some non-bank market participants had direct access to them, but most non-bank economic actors just moved their money to the biggest, safest banks. Because those banks had no need for the deposits, in fact they wanted to shrink the risks on their balance sheets, the biggest, safest banks also bought T-Bills. Smaller banks were also de-risking their balance sheets, increasing demand for T-Bills too. And traders were obviously buying T-Bills in anticipation of the Fed cutting its target rate. Was the Federal Reserve right to ignore what the markets were expecting and wanting, rates at zero and/or lower, or a massive injection of liquidity? To be fair it wasn’t just Fed fear of negative rates. Other pressures were bearing down on the Fed. For instance, going below zero would cause many money market funds to “break the buck”, i.e. break an implicit promise to protect investors capital and thus mask how they were sold, as higher remunerated, but unsecured, deposits. This prompted further concern about instability, illustrating that moral hazard was not just confined to banks, of course. 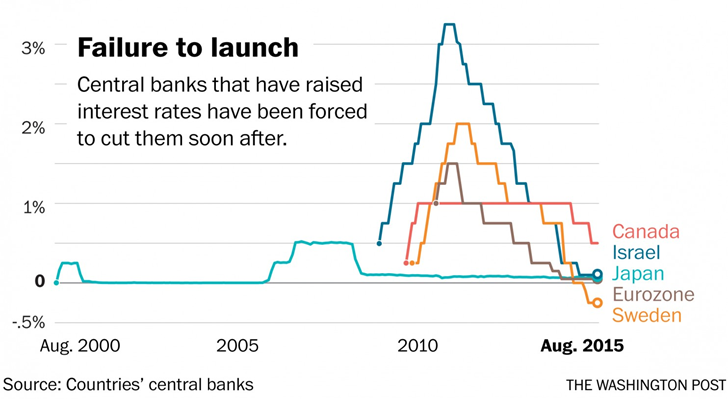 But by instituting IOER the Fed actually added to the demand for money, as banks too in their own operations moved from higher risk non-central bank assets, to zero risk central bank reserves. This was not helpful in a time of liquidity crisis. 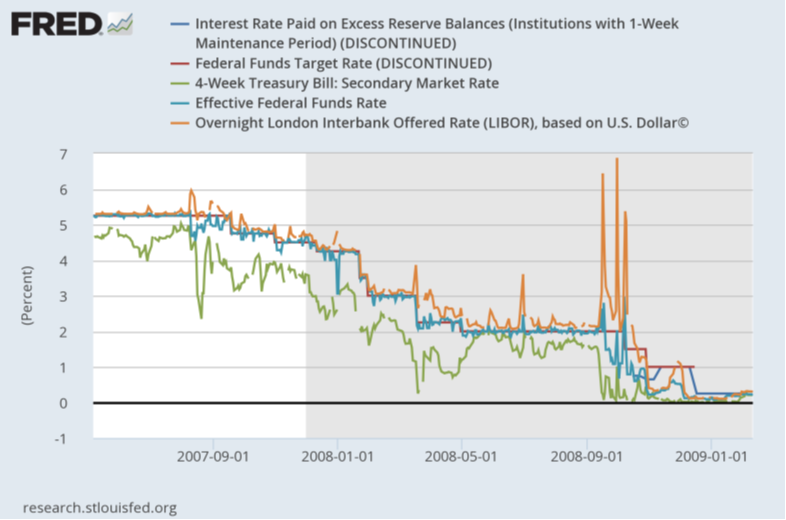 Even with IOER from early October 2008, 4-week T-bill rates still went negative twice during December 2008. T-bills have also still been negative on at least 36 days since 2009 and have only averaged a measly six basis points over that period, showing just how strong demand for money remains versus supply and thus how tight monetary policy remains. “What if” there had been no IOER is harder to establish. Market pressures would probably have driven those rates negative, just like they have in many parts of Europe in recent years. This should lead to a quicker recovery other things being equal. But it is hard to forecast how negative rates in September 2008 would have played out, if money market funds had seen a flight too. New money would still need to have been created to cope with the increased demand for it. 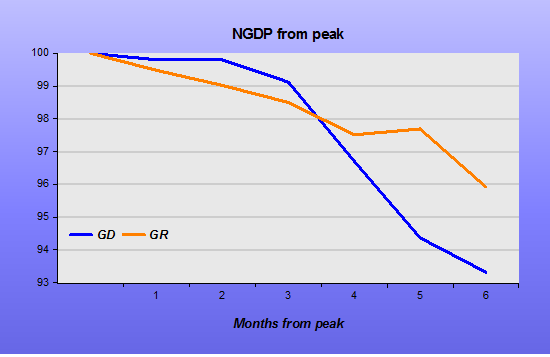 As Mark Sadowski has shown, approximately each 10% rise in base money leads to a 1% rise in NGDP. But that is only the money quantity part of MV working. The key to a recovery caused by a large drop in V is to raise expectations of more M, not just more M itself. If it is just more M it is not certain that the recovery will become self-sustaining unless there is a belief that the extra M is either permanent or will only be withdrawn once V is back up and running, i.e. after confidence has been restored. The Federal Reserve has signally failed to engender that belief in increased M being permanent: it constantly, and very publicly, plans for a reduction in the balance sheet – causing uncertainty. It doesn’t engender confidence in growth as it constantly and very publicly searches for traces of inflation picking up where none exist. And it constantly, and very publicly, supports the Philips Curve/Slack Theory of macro and so for the last several years has led the market to expect a break out of wage inflation and immediate monetary tightening. Thanks for that! But worse, it is so self-defeating. The constant and public hand wringing has led directly to the very sluggish recovery, and the constant and very public threat of a near term rate rise now appears to be slowing even this. Thanks again! Thus, at least $2.5 trillion of the post-crisis explosion of the monetary base constitutes interest-bearing inside money that in substance is government debt merely intermediated by the Fed. This is wrong, government debt has not been monetised. The Treasury intends to repay it. Government debt was bought because it was available. The Fed also bought hundreds of billions of agency debt, funding US housing. If the market really believed all this government debt and mortgage bonds had been monetised then inflation really would have been a problem. But as Hummel has noticed, it hasn’t been a problem at all. In fact, the opposite. The Fed has made it clear it will sell back the debt over time. And the market believes it. Some monetisation! Perhaps some monetisation might have been a good thing and engendered a quicker recovery. I have plugged for QE-offset or -financed tax cuts for a long time. 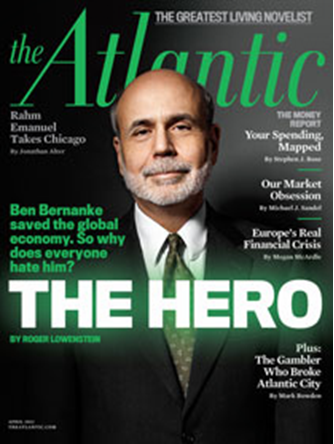 I did not know that former Fed Chairman and now multi-millionaire consultant Ben Bernanke also explicitly believed in the same thing. (My favorite is a FICA tax holiday, offset by $80 billion a month of Fed bond buying, and the purchased bonds placed in the Social Security and Medicare trust funds). Today in the U.S. we have a sluggish economy marked by weak hiring and below-target inflation (a target that is too low anyway). We are a recession away from stumbling deep into ZLB-land, from which no modern nation yet has ever returned. 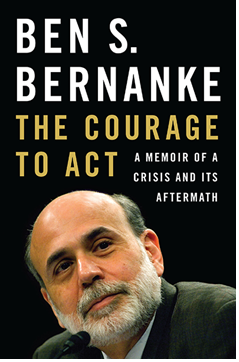 Bernanke 2002, we need you. The ECB-IMF is screaming for a Greek balanced budget. The Greeks are evidently incapable of that (like Americans, btw). Obviously, Greece should exit the EU-ECB, hold the line on spending as much as possible, and print money to balance their budget. 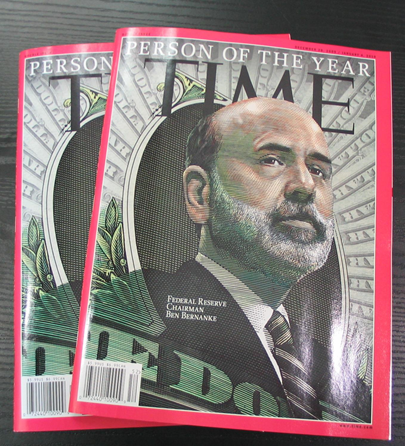 In a sense, money-financed tax cuts, just of the sort Ben Bernanke has advised for deflations. Set taxes at 100% of outlays, and then grant a 10% tax cut. The pinch-faced money ascetics are, in general, a comfortable lot eager for others to belt-tighten. But the Greek people are one-quarter unemployed. They need a macroeconomic policy that gets them back to full employment, with robust economic growth. If not my way, then what have you got?